Our top ten salad choices to green up your plate. Mashed avocado makes a dreamy, creamy, delicious dressing for this vegetable-studded chicken salad that you can stuff back into avocado shells or use to make hearty sandwiches and convenient wraps. I love old fashioned recipes as I really enjoy going back to the basics sometimes. Here are some recipes for old fashioned macaroni salads that are very good. A combination of sweet and savoury, it’s a carrot and chicken recipe loaded with crunchy bites and topped with a kick of horseradish dressing. Packed with protein and heart-healthy veggies, this salad is sure to provide you with a boost of energy. This refreshing salad is perfect with added protein at lunch. The chia seeds help the orange juice infused dressing thicken as it marinates. 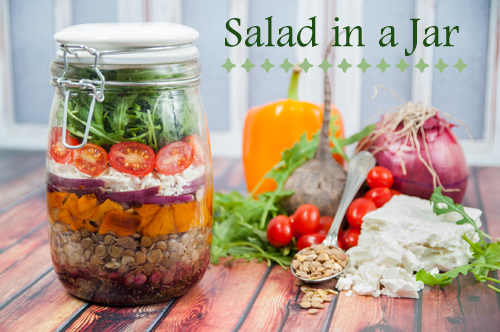 What makes this idea more than a gimmick is the staying power of salads packed into a jar. If you multiply the recipe, this salad will keep for three or four days in the refrigerator. This lets you open the fridge and grab a great, fresh, abundantly veggie meal to go, and to do it several days in a row. Chicken salad, typical of Cantonese cuisine, was a modest combination of chicken, hot mustard, scallions, cilantro and sesame seeds, served on a bed of shredded iceberg lettuce. The flavors of cannellini beans, baked beets and steamed greens coupled with the tartness of wine vinegar and sharpness of red onion are delicious together. The result is a great way to enjoy something different than the traditional tossed green salad. In this Southern-accented salad, black-eyed peas add both protein and fiber. Lots of chopped vegetables and herbs, and a dressing lean. I like to use a vinegar-based one, but combining low-fat mayonnaise with yogurt or buttermilk is good, too.